We arrived in Prague around the time of the attack on the US Embassy in Libya and the subsequent wave of protests and violence across many countries. Understandably, the four of us were concerned about the tensions in wherever we'd be headed next. Since our initial final stop on Mr. and Mrs. Reed's vacation was Istanbul, we spent several days debating whether or not to continue with the plan. Istanbul is a cosmopolitan city, but there had been some peaceful protests at the city's main university. Eventually we decided it would be better to choose a different location for the last six days of the trip. Hopefully we'll make it back to Istanbul soon. As an alternative to Istanbul, we chose Paris. I know, I know. "Well, I guess we'll go to Paris." Le sigh. We did some extreme last-minute planning, and it worked out wonderfully. After much hotel wrangling, Mrs. Reed found us an apartment to rent that was two blocks from the Louvre. (Again, I know! Incredible!) It looked out on Rue de Saint Honoré, a fancy shopping street with some great patisseries. Over the last six days of Mr. and Mrs. Reed's vacation, we walked a lot, ate incredible meals, and marveled at the sights of Paris. for so many years, it takes a while to realize that I'm actually there in person. Café Verlet is a wonderful coffee and tea shop on Rue de St. Honoré. I also feel very grown up now that I can drink espresso. I love France deeply. I have studied French since fifth grade, some of my most influential teachers were my French teachers, and my last name is French. 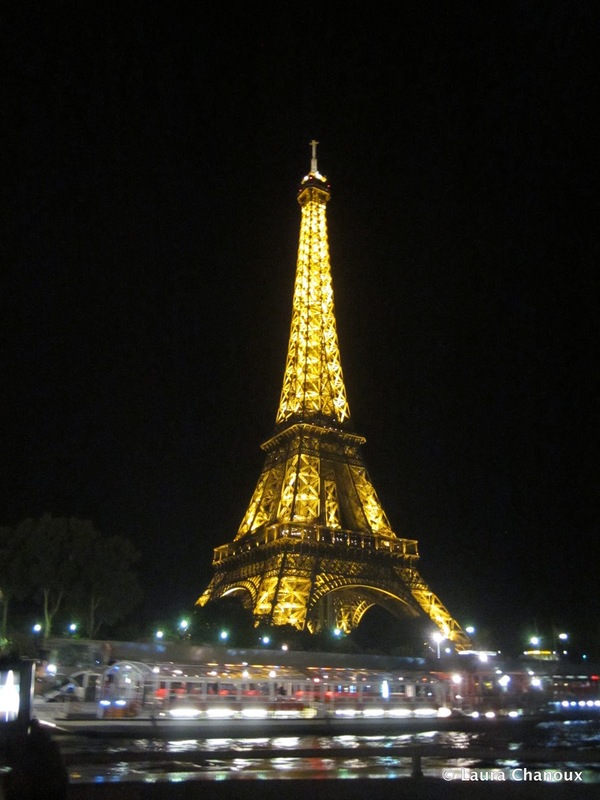 I was thrilled to be back in the country, especially since my previous trip to Paris in 2010 was shortened when Eric and I both got food poisoning. (He blames it on a salad and has refused to eat lettuce since. I find that a convenient excuse.) The only tough part of arriving was knowing that my best friend Hope had flown back to the United States the day before after spending nearly two months in Paris. Gah! So close! Paris has been documented and described by writers much more talented than me, so for now I'd like to offer some brief observations. Random French Fact #1: Of the three cities we visited with Eric's parents, France won for the best cheese boards. Eric loves cheese, so we frequently ordered whatever cheese platters we could find at dinner. Italian cheese was always good, but usually we only had three small samples of cheese per board. Prague's cheese boards were good but not memorable. In France, the land of hundreds of cheeses, we were overwhelmed by the number and quality of cheeses we were given. Cheese is a course in a traditional French dinner, usually served after the main dish. Our French servers humored us and served cheese boards as an appetizer, and oh my, it was love at first taste. I'm pretty sure Sacré Coeur was instrumental in the invention of the postcard. 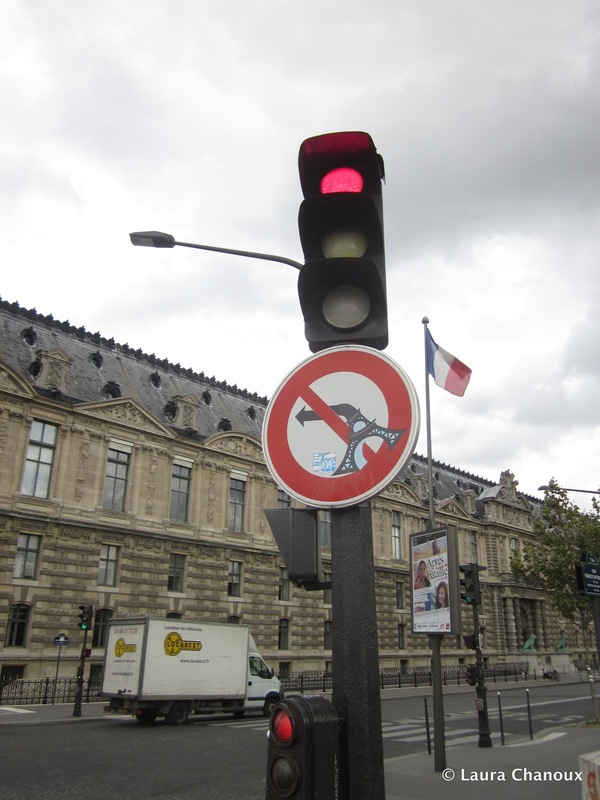 Random French Fact #3: Paris is a great city to see on your own. 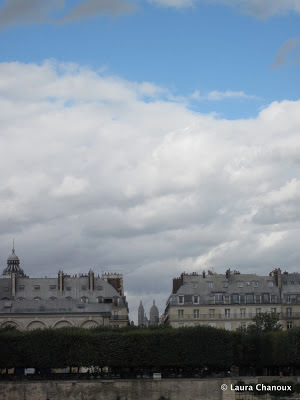 After Eric's parents went back to the US, I took myself to the Musée de l'Orangerie to see Monet's waterlilies. I loved wandering through at my own pace, doubling back to see paintings I particularly liked. (I did learn that perhaps it's best to go to museums first thing in the morning. Afternoons get crowded.) The museum is located in the Jardin des Tuileries. Though it had rained earlier in the day, the sun was was bright and the leaves were just changing colors. It was a perfect autumn day to sit, read and enjoy the park. I kind of want to live in this photograph. 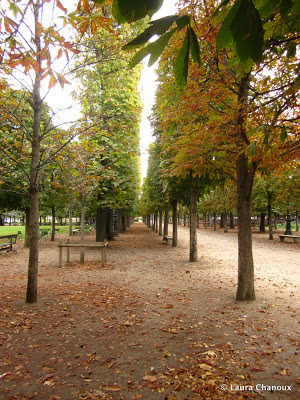 Paris has such a presence in popular culture and history that it's exciting to be there even if you're traveling solo. (Of course, use common sense and don't venture into dark alleyways alone.) It's a vibrant place to be no matter what. 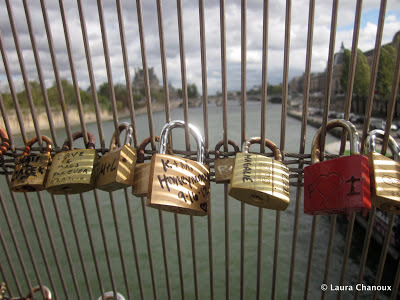 Random French Fact #4: Even though it's a great city to see alone, Paris also gives off an air of romance. 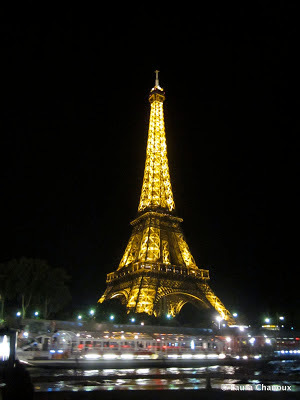 It's not just the usual images, though late night boat rides on the Seine are lovely. For me, it was the sense of the love stories that exist in Paris. 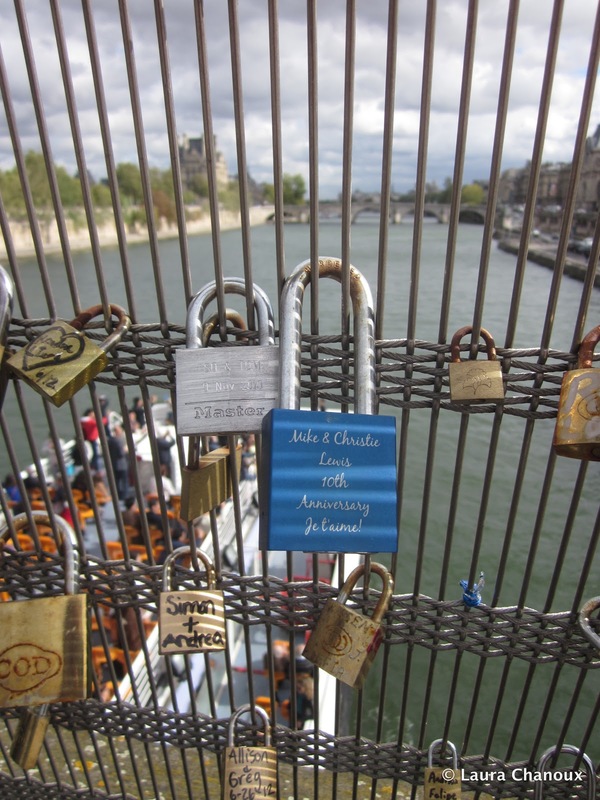 On several bridges, couples place a lock and throw the key into the river to symbolize their enduring love. 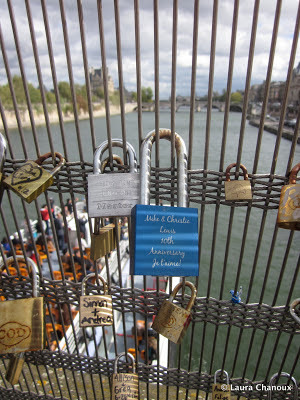 I loved walking across the bridges, wondering about the stories behind each lock. Some had names and dates scrawled on in black marker, while others had been engraved. I also love the anti-romance of the combination lock. "No, darling, I swear, I don't remember the numbers!" 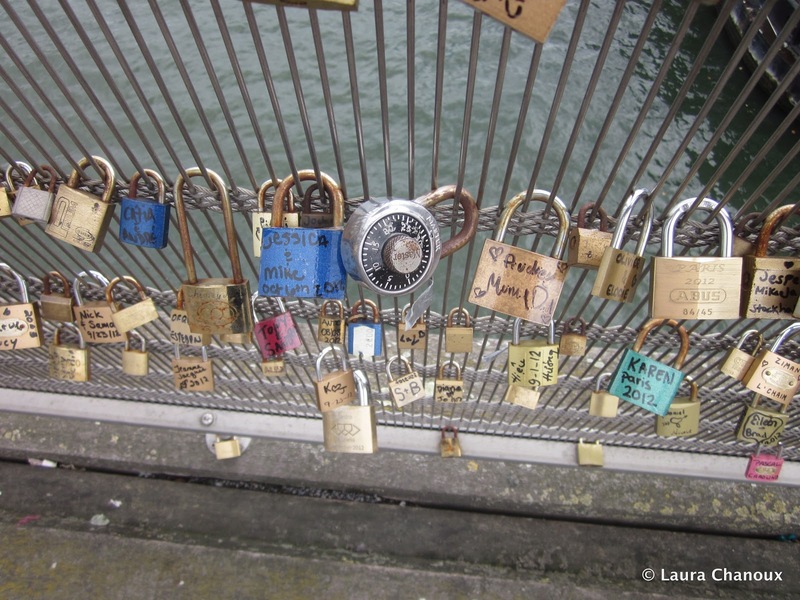 Each lock is a moment in two people's relationship, with so much story leading up to clicking the metal and tossing the key away and so much story after they leave the bridge hand in hand. Where did they go next? Are they still together? Will either of them come back with another partner, or will they always associate the bridge with that moment? Random French Fact #5: Paris is hard to leave. After Eric's parents left, we moved to the Rue Mouffetard for our last few days in the city. It's a busy student area with great food, markets and bars. I would have moved in if we'd found a cheap apartment (ha!). Sadly we had to leave due to visa constraints in the Schengen Zone and cost. (Man, Paris is expensive.) 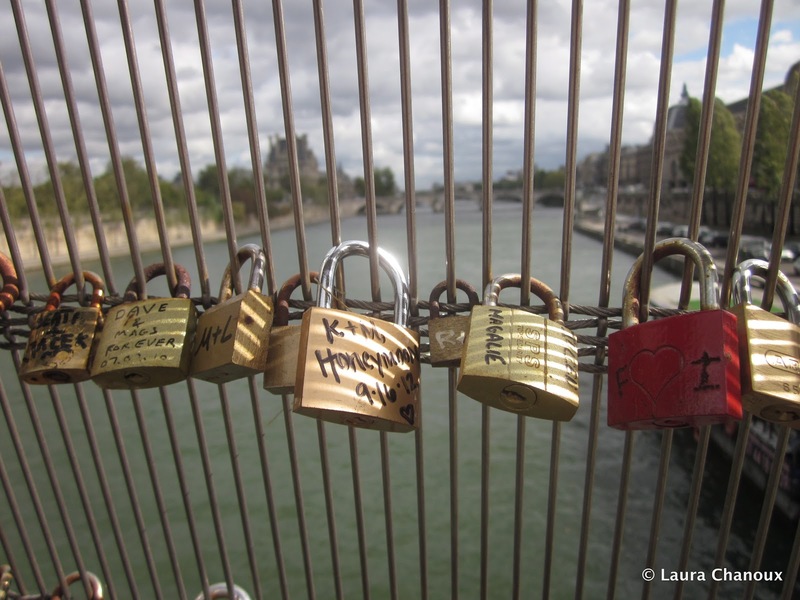 It's easy to fall in love with Paris, in Paris, but it is not easy to get back on the road. Raclette, a meal of melted cheese, baked potatoes, ham and pickles - delicious! There were multiple raclette restaurants on the rue Mouffetard. Since September 25, Eric and I have been in the United Kingdom (so we got away from the Schengen Zone, but not the expense). Our three weeks with his parents went by quickly in a blur of gorgeous cities and amazing food and wine. We had a great time and are looking forward to future trips with the Reeds. What did you like/love/remember most about the city? 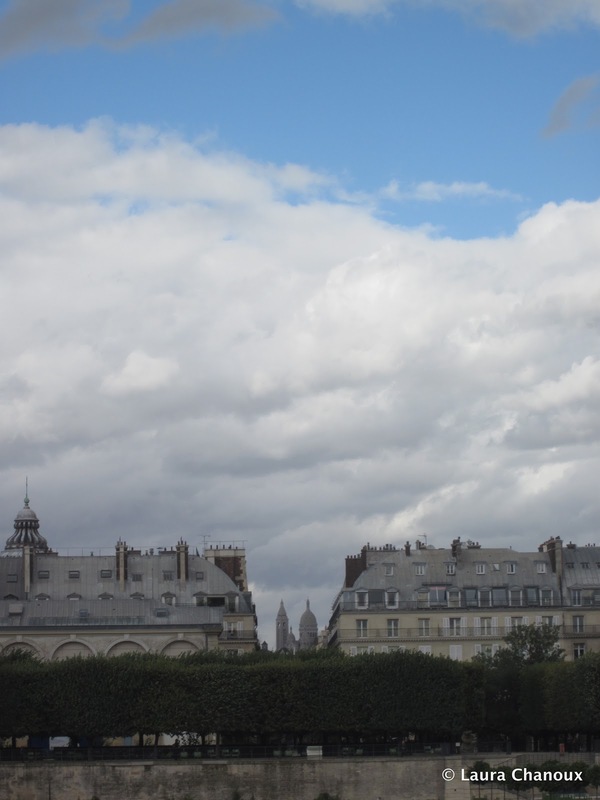 I would like to return to Paris again and stay in a (better heated) apartment or perhaps a hotel :) I loved the city but it was cold and rainy my entire trip there. Your pictures are great! Oh and I ate a raspberry tart that was similar-looking to the one you posted a picture of :) delicious. Great food there.